The Artesia High School track program had plenty to celebrate Friday following the annual Artesia Invitational. The Bulldogs and Lady Bulldogs picked up six new state qualifications and re-qualified in six events. The first relays of the season punched their tickets, and a school record fell. And the Artesia girls and boys placed third and tied for fourth respectively out of talent-laden fields. Despite the blustery conditions early in the meet, the teams were able to notch some of those qualifications they’d been seeking amidst some standout performances. Bulldog junior Kale Mauritsen, as Conn put it, wowed the crowd throughout the night with his participation in five events in which he competed, breaking a school record in the 300-meter hurdles with a re-qualifying, first-place time of 38.20. Mauritsen also re-qualified in the pole vault with a second-place jump of 14 feet and logged new qualifications as part of the 400- and 1600-meter relay teams, who finished third and second respectively with times of 44.19 and 3:30.99. Joining Mauritsen in qualification on the 400 relay team were Joe Willingham, Erik Cueto and Israel Estrada, while Cueto, Willingham and Ian Robson rounded out the 1600-meter team. Willingham delivered one of Artesia’s long-awaited qualifications in the 110-meter hurdles with a third-place 16.11, and Carson Anderson also became a first-time qualifier in the pole vault with a vault of 12 feet. On the girls’ side, the Lady Bulldogs picked up two new state qualifications, courtesy of Madilynn Moon in the pole vault with a first-place vault of 8’6” and Camerin Molina in the triple jump with a third-place, 33’6” leap. Re-qualifying were Sadi Butler in the 100 hurdles (second, 16.74), Rylee Peak in the discus (second, 107’6”) and Paityn Houghtaling in the javelin (fourth, 108’2”). 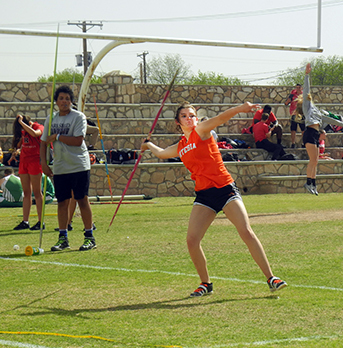 The Artesia track and field teams will now prepare for their final regular-season competition of the year: the annual Ross Black Relays in Lovington, set for 3 p.m. Friday.